The state of multinational operations in Afghanistan after 2014. Currently NATO/ISAF shares the greatest responsibility conducting operations and restoring peace in Afghanistan. However, other non-NATO countries including Australia, the Russian Federation, Japan, Colombia, Georgia, and India contribute to rebuilding efforts. Of the 49 troop contributing countries, 21 are non-NATO members. Additionally myriad efforts by various United Nations bodies and non-governmental organizations (NGOs) provide resources in the form of manpower, money, and materials. As more willing states contribute to the recovery efforts, the command and control relationship will trend to a coalition of sorts. In effect we already see a coalition of willing member states. Conceivably, security operations and humanitarian work which is predominantly supported by NATO states will shift toward a more dominant role by willing states. Additionally the Afghan government and security forces will continue to assume a greater role in the recovery and rebuilding process. At present, the United States remains the majority member for nearly every aspect of security, recovery, and rebuilding efforts to include troop contributions and humanitarian aid. The United States provides more troops than all countries combined by a factor of two. The United States consistently contributes almost 50% of financial reconstruction aid. 97% of Afghanistan's licit GDP is derived from foreign aid dollars. Currently Afghanistan yields no relevant growth rate because GDP is heavily based on foreign aid. Given these and other data, it is not conceivable to anticipate a significant reduction in U.S. contributions through 2014 because a significant reduction could upset the fully dependent Afghan security and financial system. That financial system represents a major source of credibility and functionality of the Afghan government. Without it, the Afghan government could not feasibly sustain a functioning security force or even basic security measures. Therefore, foreign assistance which is currently predominantly NATO driven will continue to be critical beyond 2014. The current command and control architecture may adjust to include greater responsibility by Afghanistan herself. It may also adjust to reflect a reduced role by NATO entities to include the dominant U.S. role. This structure will suggest greater coalition effort vice NATO effort. Yet, NATO will continue to bear the greatest responsibility in terms of money and resources. Although, the state of multinational operations beyond 2014 will look more like a coalition of willing states, NATO will continue to be the primary partner for lasting peace. Since NATO will still be the primary source of funding and resources, an integrated command will fulfill the best command relationship. That integrated relationship, however, will begin to transform into a quasi-lead nation relationship whereby Afghanistan transitions to full control. By 2014, that control will not be complete. Afghan control particularly of foreign security forces would be limited, so a lead nation role by Afghanistan would require sponsorship by a NATO member. The ideal NATO choice to sponsor Afghanistan is the U.S on account of present and forecasted contributions. Ultimately NATO will retain primary control over the majority of security, recovery, and rebuilding efforts. This serves two purposes. First, the greatest share of security forces will continue to be NATO and partnered nation troops. Even as anticipated draw-downs occur, the bulk of security will come from ISAF. Responsibility for command of those troops should not cede to another international body. So, an integrated command will ensure national contributions of military forces remain unified. Second, as forces draw down and humanitarian assistance either remains constant or increases, the relevant change from largely military efforts to increasingly civilian efforts will require oversight by a unified element that is neither foreign nor predominantly military. This, therefore, requires a strong unified command (NATO) within the confines of host nation Afghan leadership (depicted below). This design is in keeping with NATO's renewed lasting partnership with Afghanistan as well as the interest for transition to overall control to the Afghan government. International Security Assistance Force. "ISAF." Troop Numbers and Contributions. September 9, 2011. http://www.isaf.nato.int/images/stories/File/Placemats/9%20September%202011%20ISAF%20Placemat(1).pdf (accessed September 29, 2011). The World Bank. "The World Bank." Afghanistan Reconstruction Trust Fund. August 2011. http://www.worldbank.org.af/WBSITE/EXTERNAL/COUNTRIES/SOUTHASIAEXT/AFGHANISTANEXTN/0,,contentMDK:21947849~pagePK:141137~piPK:141127~theSitePK:305985,00.html (accessed September 29, 2011). Senate Armed Services Committee Majority Staff. 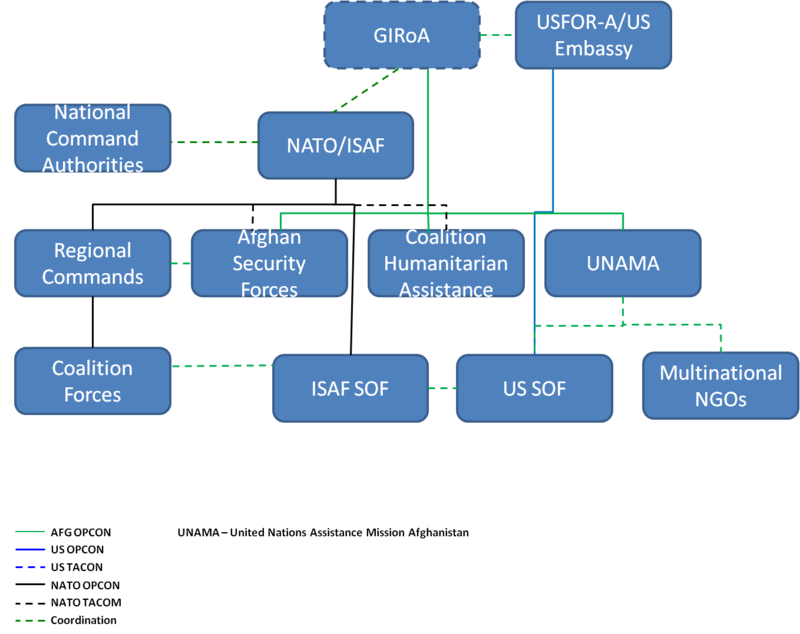 Evaluating U.S. Foriegn Assistance to Afghanistan. Senate Armed Services Committee Report, Washington D.C.: U.S. Government Printing Office, 2011. The World Bank Afghanistan Data. 2011. http://data.worldbank.org/country/afghanistan (accessed September 29, 2011). North Atlantic Treaty Organizations (NATO). "Declaration by NATO and the Government of the Islamic Republic of Afghanistan on an Enduring Partnership." NATO, November 20, 2010.